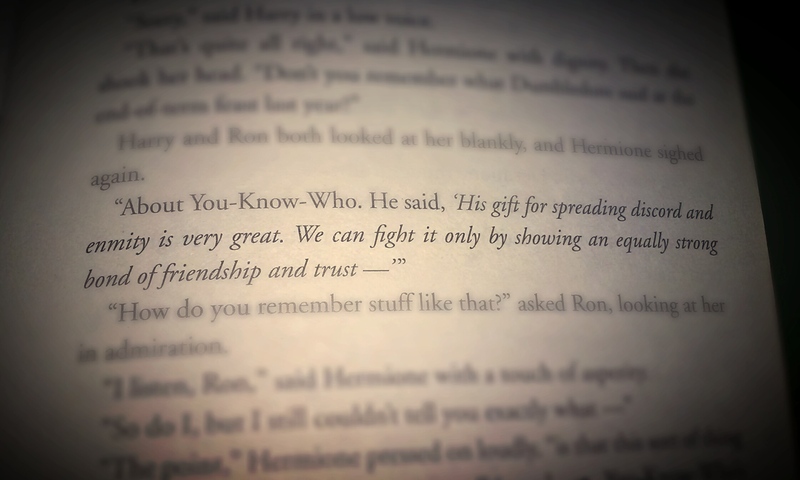 This quote from Harry Potter and the Order of the Phoenix jumped out at me last night. Well, not literally jumped out. Although, that would have been very Harry Potter of it. When I read the words about the evil one (Voldemort), it made me mindful. I had to pause, read it again, dog-ear the page so I could flip back to it easily. The enemy (Voldemort…shudder) was an expert in causing divides among friends in an effort to overcome them with his evil. The only way to defeat him? Unity. I’m going to be honest with you, there are a whole lot of people who I’ve hidden from my “timeline” on Facebook. I can’t see what they post. Because I can’t stand the discord their posts cause. This same person called people who took exception to this “rude nut cakes”. She also compared “anti-vaxers” to abortionists. She told people who disagreed with her to “GO AWAY”. Oh. And she talked about Jesus in that post, too. This kind of thing raises my hackles. It upsets my tummy. Makes me flustered and embarrassed and just plain old upset. And, guess what, it has nothing to do with the vaccination debate. It has to do with the way this woman has chosen to holler about it. Her words are divisive, ugly, poison. There is nothing of unity in her posts. Let’s revisit that idea from Harry Potter…and let’s alter it just a smidgen. The enemy (satan) is an expert in causing divides among Christians in an effort to overcome us with his evil. The only way to defeat him? Unity in Christ. That’s not to say we agree on all things. We won’t. And that’s all right. It’s in the way we handle our disagreements. Are we rending the Body of Christ in an effort to be right? Then satan wins that battle. It’s insanity to claw at your own body. That’s what we do when we attack our brothers and sister in Christ. Are we putting love behind our words of disagreement? Are we seeking to maintain our Oneness in Jesus? Are we acknowledging the worth of the other person as an image bearer of God? Good. I believe that, in this, God is glorified. When I was a kid, growing up in the United Methodist Church, I was taught the value of love. Say what you might about that denomination, they sure know how to love people. All people. We sang a song called “They will know we are Christians by our love”. It’s straight from John 13:35. The words of Jesus, “They will know you are My disciples if you love one another”. Not if you can win a debate. Not if you’re always right. Not if you’re the loudest in the screaming match. Not if your candidate wins the election. But they will know we are Christians, followers of The Christ, by the way we love each other. By the way we stick together. Pray for one another. Serve each other. By the way we lovingly approach disagreements. It’s Lent, my friends. A time to reflect on our lives with Christ. It’s a great time to focus your prayer life. Can we pray for unity within the Body of Christ? Our brothers and sisters in places like Iraq are being murdered for their faith. This is one thing we can pray for in unity. Right? Pray, even if you don’t know what to say. Just tell God your concerns and that you have no other words. The Bible says that The Spirit will take over. GREAT post, Suze!! And that’s what I LOVE about Harry Potter – lots of redemption theories in that series of books!! I’m reading them so that I can figure out when the kids are ready for them. We’ll read them together so that we can discuss just this kind of thing. They are great. I see a lot of great Christian themes in the Harry Potter books, as well. Whether J.K. intended them to be there or not. God can work through the most unexpected methods–He is Amazing! And I agree wholeheartedly, it saddens me to see our body of Christ tearing at each other. Christ teaches us to die to self and place others before us and he gave the ultimate sacrifice in that manner. It doesn’t mean we have to agree with everyone but we need to be respectful and loving in our responses if we feel compelled (by Him–I’ll add) to make a response at all. Love your post and you–dear lady! Some people yell because they don’t believe they will be heard otherwise. Some people don’t hear because they are too busy trying to solve the problem instead of listening. In both cases, people are struggling to fit in, to belong, to be valued by others, to be loved. One asks, Why can’t you see the value of my opinion? while the other asks, Why can’t you understand the value of my wisdom? One is hurt and angry because her opinions are disregarded, while the other is furious because her wisdom is rejected. Neither is able to discuss the topic calmly and rationally because their self-worth is tied to the responses. Both find comfort in the company of like-minded people. Tribalism is the natural recourse of the disenfranchised; we gain courage and self-worth from the company of those who support us in our beliefs, rational or not. And given the peculiar talent we humans have for rationalization and self-delusion, we find ways to remain entrenched in those beliefs regardless of their validity because of the deep and abiding need for acceptance. Some churches attract people who need well-defined boundaries; they seem to spend the majority of their time and effort looking for reasons to exclude others. Other churches attract people who don’t like rules and regulations; they spend their time trying to make the Bible fit the culture rather than the other way around. The one who has knowledge uses words with restraint, and whoever has understanding is even-tempered. Even fools are thought wise if they keep silent, and discerning if they hold their tongues. oh Susie, I love your posts. I learn from them. Always. And I must admit that I am kinda happy that you do the same thing I do in hiding people’s posts so I don’t have to see them. I actually even go a step further for some people – I love the fact that Facebook has the “list” feature for friends. Because there are at least two people that I don’t allow to see very many of my posts at all – because I don’t wish to be attacked by them in their responses to what I say. And it makes me deliriously happy that you see in the Harry Potter books what I saw, too! There are times I think I’m a little nuts in seeing Christ teachings in the books – only said slightly different. One of the biggest things I saw was one of the characters hating what he called “mudbloods” because they are different and not acceptable. And how Harry and his friends told him he was wrong and all were accepted. (My interpretation). LOL … there are times lately that I feel like a shy fangirl of yours.